We rarely offer designs that are THIS Victorian, but we couldn’t resist. 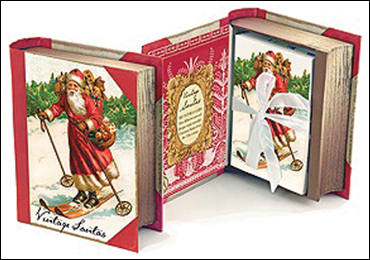 This beautifully designed, book-shaped keepsake box contains 20 blank cards with 4 different Victorian Santas on them, all tied together with a satin ribbon. Each 3-1/2” X 5” card can be used as a mailed greeting (matching envelopes) or as a gift card to attach to your presents.